The Sections of your Subscription Page! Many pet parents love and depend on our subscription program. 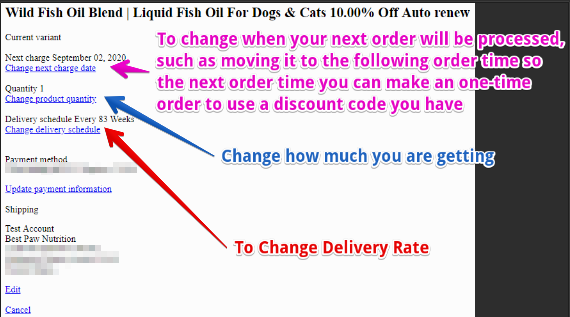 While some like to have their subscription on Amazon, it is limited to a 5% discount on every subscription order, however, we are able to offer a 10% discount. If you have an active order subscription you can change subscription information there as well such as where it sends to, how often, what it sends etc. 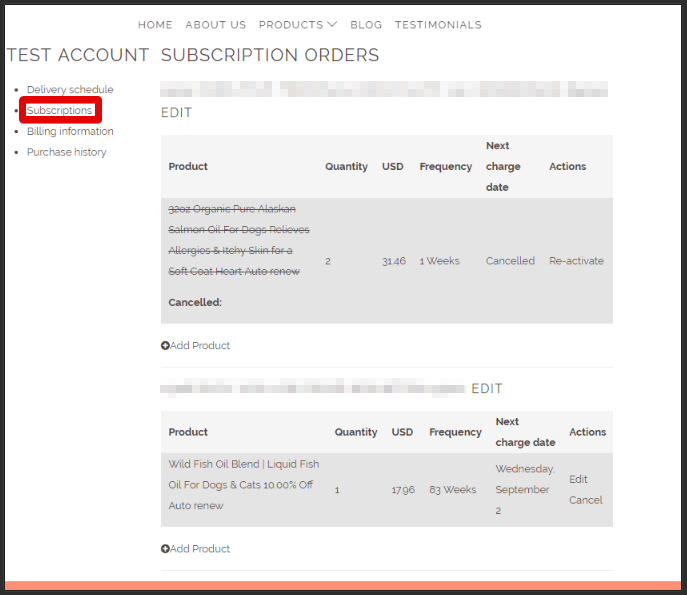 If you do not see "Manage Subscription" then you do not have an active subscription with us. On the new page that opens look slightly to the right where it shows your account information. Find the text that says "Manage Subscription" to make any alterations to subscriptions you may start. The delivery schedule section on the left side of the page is where you can find your upcoming deliveries that are near the current date. If something is way in the distant future, it won't show here, but orders that are soon to be made will show up! The subscriptions section is the page where you can see all of the products you subscribed to! It will show you which address a particular order is going to, which products, how many, the price for that product, frequency of order, when the next charge date is or if it has been canceled, and the actions you can make towards a particular subscription. This is the section you will want to go to if you need to make any edits to a particular subscription, including changing the order frequency or skipping the next upcoming order. You can also add products to a particular subscription on this page if you so desire. As a quick reminder! If a subscription order has an order value of $40 or more, it will qualify for free standard shipping! If it's $50 and over, it will qualify for free expedited shipping, and if it's $60 or over it will qualify for free priority shipping! All orders will also earn you points in our points program as well! 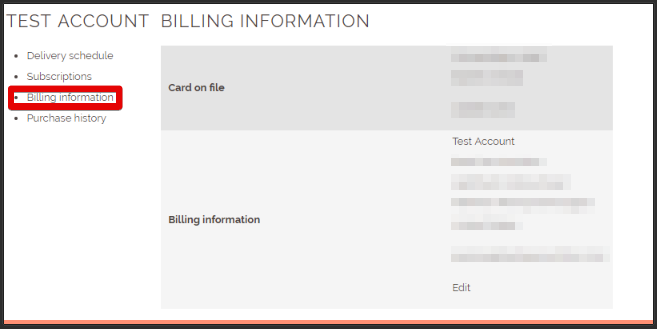 The Billing Information section is the page where you can edit which card you are using for your subscription and can update it when it's time to update your card. Don't worry! If you forget to update, or your card gets close to its expiration date, we do have an automatic reminder email which goes out to let you know, so you don't miss on getting the supplements your fur family needs, and the treats they adore. The Purchase History section is where you can see all the previous orders that have been shipped to you! Just in case you need to see what has been sent when and for how much if you have to do a little bookkeeping.